With the likes of AT&T, Disney and Comcast all attempting to diversify revenues, the riches being raked in by Netflix in the entertainment streaming market must look very tempting, though the rewards will not come easily. This is not to say there is not room for new services, the price point creates an opportunity for multiple service providers in a single household, but Re-Think is predicting Netflix will continue to hoover up profits. Despite going through years of dredge, swallowing the ‘reward’ of being a loss leader in an emerging market, Netflix shareholders are beginning to see the breaking dawn. During the last earnings call, CEO Reed Hastings proudly told shareholders revenues had grown 35% to $16 billion across 2018, with operating profits almost doubling to $1.6 billion. The business finished with 139 million paying memberships, up 29 million across the year. 139 million might sound like an incredible number already, but then you have to consider whether this is just the beginning. International subscriptions, outside of the US market, accounted for approximately 63% of the total offering plenty of headroom for growth. The team is forecasting an additional 9 million additional subscriptions over Q1 alone. This is the challenge which the upstarts are facing. Not only is this a company which is sitting very comfortably in the number one spot, but it has momentum which it is doubling down on. At IBC last year, Maria Ferreras, VP of EMEA Business Development at Netflix pointed towards partnerships with telcos (carrier billing), more original and local content, as well as launching in new markets to continue the growth. During the results call, Hastings confirmed these plans were scaling up. The relationships with local partners were working well, and the team were searching for more, while more investment was being directed towards content. Investments over the last twelve months totalled $7.5 billion, and this number will only grow. It probably won’t be on the same trajectory as previous years, but the number of big-budget titles are visibly increasing on the platform. “The extraordinary success of Netflix has got it lined up in the sights of the big studios and content houses and the big question now is how well it will stand up to that assault on multiple fronts,” the report states. Hulu is an established platform, as is Amazon Prime, but with Disney entering the market with an impressive portfolio, while Comcast is pushing forward, and AT&T will soon start making waves with its $85 billion acquisition of Time Warner. There is a lot of competition emerging on the horizon, but these the upstarts have a lot of distractions. Over the next couple of months, we see two developments which will worth keeping an eye on in this space. Firstly, the protection of traditional TV services and also the consumer appetite for AVoD services, streaming with advertising. Advertising is clearly big business. In the UK, you only have to look at the success of Sky as the leader in the premium content space as an example. Like the social media giants, Sky has created a sophisticated advertising platform, AdSmart, allowing advertisers to drive engagement through hyper-targeted campaigns. This model continues to work with Sky, but perhaps it is living on borrowed time. The Netflix model is the opposite. An upfront payment and the promise of no advertising to break-up shows or movies on the platform. The more people who subscribe to Netflix, or similar platforms, the lower the tolerance for adverts will become. Netflix might be missing a cash generation opportunity, but it also might be irrevocably changing the industry. This will not happen overnight, but it might be the light at the end of the tunnel. The second point, protecting legacy services, is going to be a tricky one. The likes of Comcast and AT&T will have cash revenues to worry about as they effectively cannibalise themselves in search of the OTT dream. Looking at the revenues on the traditional TV services, Re-Think is forecasting AT&T will decline from $64.7 billion in 2018 to $47.7 billion in 2024, Comcast from $25.8 billion to $20 billion and Disney from $11.5 billion to $9 billion. Should these companies encourage users to migrate to their streaming alternatives, the decline could be even steeper. This might give the streaming service more opportunity to succeed in an increasingly fragmented market, but investors might get spooked. It’s a catch-22 situation, with one option killing revenues but the other holding back a more future-proofed concept. The challenges for those trying to break Netflix dominance is not only dealing with the beast’s popularity, but also handling the internal politics of change. This might be much more of a challenge, especially when you consider the traditional culture of the challengers. Ultimately the feedback here is relatively simple; Netflix is king and don’t expect the usurpers to wobble the throne too much. It might sound like a PR plug to stay relevant, heavily relying on friendly buzzwords such as customer centric and corporate social responsibility, but there is some pragmatism in behind the fluff. Like many telcos around the world, Verizon appears to be prepping for a restructure to refocus the business on tomorrow’s digital bonanza. The plug itself seems to be focused on five areas. Firstly, corporate social responsibility. This will now be one of the promoted corporate values of the business, and will also factor into procurement decisions, but will also likely be included in various marketing campaigns. While this sort of announcement might get some excited, Verizon is late to the show and, quite frankly, we’re surprised it has taken this long to include CSR in the corporate values. This is PR 101 and is a play which almost every other company on the planet is taking advantage of. Verizon might plug this as ‘innovation’, but the tiresome beast is catching up on a trend which ran wild years ago. Secondly, the business will split into two business groups, Consumer and Business. Again, this seems like a move which should have been made some time ago. Thirdly, Verizon 2.0 isn’t just a PR play but also symbolises progress which has been made on the network. Network virtualisation and softwarisation of the network is key here, and a critical component to ensure Verizon is a competitive force in the digital economy of tomorrow. This is the fourth point which to us sounds like corporate slang for restructure. It might sound like a dirty word, perhaps because pain is a natural accompaniment to restructure, but it is critical. If Verizon is to maintain its lofty position of influence, it needs to be a business which is ready for the digital economy. This might mean redundancies, but it will certainly mean evolving from a Communications Service Provider (CSP) to a Digital Services Provider (DSP). The final plug is innovation, the most overused and meaningless buzzword in the technology industry. Innovation means very little when everyone claims to be innovative because, quite frankly, only a small percentage actually are. For Verizon, this means pushing into new segments and offering new services. The imagery in the promotional video, which you can see at the foot of the article, suggest data is going to be a key aspect. This might not sound revolutionary or new, but it is critical. The data intensive industries of tomorrow are going to rule the economy, but the telcos are not sitting in a strong position to capitalise on the gains. Trends are leading the telcos towards the role of utility, though there is still an opportunity to play a valuable role in the blossoming and disruptive segments. This is the crux of the message; Verizon is attempting to re-model itself as a business which is relevant for the digital economy. It wants to be a partner of these innovative companies, offering services which go above and beyond the connectivity utility. BT is considering further redundancies to increase profitability at the firm, with 25,000 jobs, a quarter of its employees, reportedly under threat. According to Bloomberg, the battle-weary telco is mulling over the plans as new CEO Phillip Jensen prepares for his first meaningful earnings call in May. The telco has not confirmed or denied the reports thus far. Having taken over the business from Gavin Patterson in February, Jensen is currently in the unenviable position of turning the supertanker. BT has been under pressure in recent years, not only due to an industry where profitability is decreasing rapidly, but with increased competition and CAPEX demands from the government, none of the trends seem to be favouring BT. Sources claim internal discussions have been taking place, setting a target headcount of 75,000. The redundancies will allow for greater automation of back-office roles, while the team is also considering business disposals and streamlining the management functions. The plan is reportedly to trim headcount down by 25,000 by 2023. This is of course not the first time BT has discussed redundancies, with the team also announcing 13,000 cuts back in May. The first round of cuts accompanied efforts to overhaul BT’s supply chain as part of a wider restructuring process to make the business more agile and fit for the digital era. These cuts, should the rumours turn out to be true, would be seen as a continuation of this strategy. 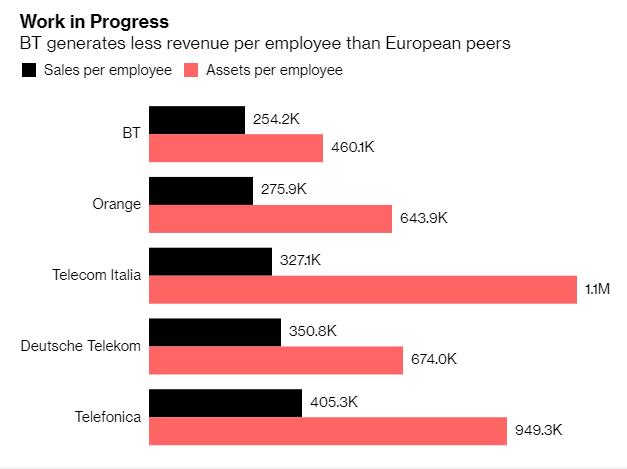 As you can see from the graph below, BT is not in the healthiest position and could be viewed as bloated in comparison to other telcos throughout Europe. Jensen now has the unenviable role of ensuring BT is fit for purpose, both from a business and network perspective, as the demands of the digital era start to weigh heavy. Not only has BT got to fuel 5G deployment, fibre connectivity is being demanded by customers and the government. BT has seemingly been able to ignore some of these demands in by-gone years, but the emergence, and initial success, of alt-nets are providing stern competition. Although investors are seemingly happy with the rumours, share price increased by 1.6% following the report, we’ll have to wait until May to get the full details. It is believed Jensen will unveil the next stage of BT’s transformation during the earnings call. Although this investigation is relatively broad, this might be another attempt from the US Government to get a handle on the privacy practices of the fast-evolving digital economy. Several scandals over the last 18 months have demonstrated current rules are not fit for purpose, containing too many loopholes and inadequately governing an industry which has progressed beyond the reach of bureaucracy. The FTC has been under pressure in recent months to get a better handle on the data machines which power the digital economy, bringing in billions for the likes of Amazon and Google, but increasingly the telcos. While many fingers have been pointed at the residents of Silicon Valley, the telcos have been making money through the transfer of personal information also. This investigation is an important step forward in creating a better understanding of the data and sharing economy, a foundation to create resilient and future-proof regulations. Some might suggest this sort of investigation should have happened years ago, but hindsight is always 20/20; who would have predicted the scale of scandals we have witnessed recently. AT&T, AT&T Mobility, Comcast Cable Communications, Google Fiber, T-Mobile US, Verizon, and Cellco Partnership are the firms which have received the demands. As you can see, this is an incredibly broad and in-depth request, with a lot of the information being non-public. Many of the telcos who have been sent the orders will be uncomfortable releasing this information, though they’ll have no choice. Although this is a good first step for the FTC, we would hope the investigation is broadened further in the future. More information and insight needs to be collected from the OTTs, the masters of manipulating the data-sharing economy. The telcos are small fish in this expedition, but it is progress. All eyes from the data-sharing community will be keenly directed towards the FTC over the next couple of months. While this investigation is nothing more than a virtual pebble dropped into the digital pond for the moment, there is the potential for those ripples to grow into waves. This could be the first step towards major regulatory reform, an overdue revolution to gain a better handle on the wild-west internet economy.